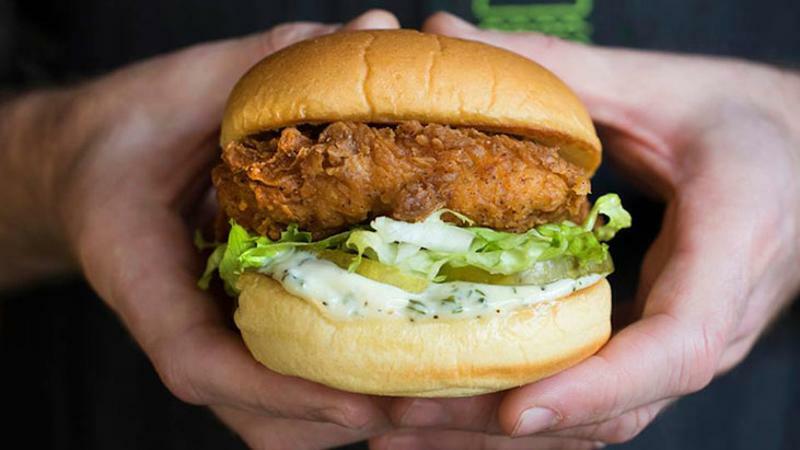 The January rollout of the Chick’n Shack sandwich has been a boon to guest traffic at Shake Shack, which grew 7.3 percent during the first quarter, the chain said Thursday. That jump contributed to a 9.9 percent increase in the chain’s same-store sales during the same period, Shake Shack said. The chain will likely expand its chicken platform in the future, Garutti noted when pressed by an analyst, adding that the chain’s culinary team is “really excited” about possible new applications for the protein. Shake Shack, a chain generally known for its streamlined menu, has recently upped its experiments with limited-time items and regional specials. The Chick’n Shack has been serving as the chain’s LTO for the first half of the year, Garutti said Wednesday, but it plans to introduce the Bacon Cheddar Shack as an LTO in the back half. The burger, topped with bacon and a white-cheddar sauce, will sell for $6.89. The Chick’n Shack debuted last summer as an LTO limited to a handful of units in Brooklyn, N.Y. Garutti then noted that initial demand for the sandwich was so “overwhelming” that the three locations offering the item ran out of supply in just two days. By adding fried chicken to its permanent lineup, Shake Shack has positioned itself to better compete with fried chicken juggernaut Chick-fil-A.